When you’re looking for LG appliance repair in Los Angeles, chances are a DG Appliance Service is already in the area and may be available for same day service. The best way to find out is to give us a call now. With LG factory trained technicians, a very large coverage area, family service, and fast repairs done right, there is no reason not to call DG Appliance Service today. When one of our LG factory trained technicians performs your refrigerator repairs you get piece of mind knowing they are not only quickly fixing your appliance, they’re also providing you with manufacturer specific maintenance recommendations. This means that your LG refrigerator, washer or dryer will be repaired quickly, correctly, and by knowledgeable experts. Also, you will be provided with expert care advice from our LG factory trained technicians which will help you keep your refrigerator running properly and avoid future service calls. Perhaps you’ve seen our appliance service vans parked in Los Angeles traffic. Maybe you’ve seen us in the driveway of one of your neighbors, or they’ve told you about the incredible service we provided for their LG refrigerator. 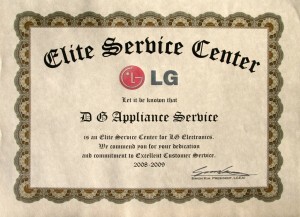 No matter how you found out about LG Authorized Appliance Repair Los Angeles Service Center, we’re glad you did. However, you may have some friends living outside of Los Angeles who could benefit from a good appliance repair center. This is why we dispatch our service vans from our home base in Chatsworth, CA. From there, they travel into San Gabriel Valley, San Fernando Valley and Ventura County. These appliance service vans make frequent stops in the cities of Chatsworth, Canoga Park, Woodland Hills, West Hills, Reseda, Van Nuys, Winnetka, Porter Ranch, Northridge, Sherman Oaks, Encino, Agoura Hills and Oak Park. In addition, we make occasional trips to the Ventura County cities of Westlake Village, Thousand Oaks, Newbury Park, Conejo Valley, Simi Valley, Camarillo, Oxnard and Ventura. So, even if your friends and family don’t live in Los Angeles, you can still recommend DG Appliance Service as many others have already done. One reason that so many of our customers have referred their friends and family is that we treat them as part of our own family. This is the reason that our LG Authorized Appliance Repair Los Angeles service trained technicians take the time to explain proper care and maintenance procedures in plain language. Our business is to keep your LG refrigerator, washer or dryer operating properly and out of the repair center. This is best done through proper routine maintenance and this is why we take the time to show our customers how to avoid future refrigerator repairs. Fast Repairs Done Right The First Time! How can refrigerator repairs be done fast and still done right? 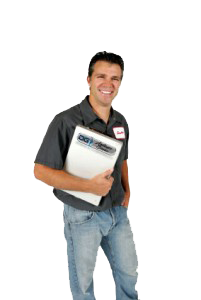 Simple, hire an LG factory trained technician with plenty of experience for your refrigerator repair. Our technicians are very experienced, factory trained, and we take the time to get to know our customers as well as their appliances. This allows us to properly train customers to care for their appliances in order to avoid future problems.